Flowers (or herbs) have been used at weddings as early as the ancient Greeks, and were used a way of showing love and well wishes to everyone. Brides often wore crowns of flowers, which were considered a gift of nature (similar to the laurels worn by Caesar). Brides also carried garlic and dill instead of flowers, as they were believed to ward off evil, ill health and bad luck. Early times in England, the bride and her bridesmaids would walk to church together. A small girl would lead the way whilst sprinkling flower blossoms along the path, so the bride would have “a life filled with flowers and happiness”. This tradition is continued now with those that have “flower girls” throwing rose petals down the aisle. During Europe’s Middle Ages it was tradition to only bathe twice a year, which normally fell before Christmas and summertime. Weddings usually took place in the spring, resulting in the wedding party not smelling exactly “fresh”. The solution was to use flowers and herbs, either sewn into the clothes, or the bride would carry a large bouquet of flowers, to mask the body odours and make the day more enjoyable for all. Your wedding flowers may be a large part of your wedding budget, and are also one of the most photographed items (apart from yourself) of your wedding day, so it’s a good idea to make sure you get the perfect bouquet, that reflects you and your personality. The only thing to consider is, Cyprus is a very hot country and flowers can be difficult to grow here, especially in the summer months. Many flowers have to be imported on to the island, and so, be sure to plan ahead, and make sure your wedding planner or florist has at least 2 weeks’ notice if there is a particular flower you want. 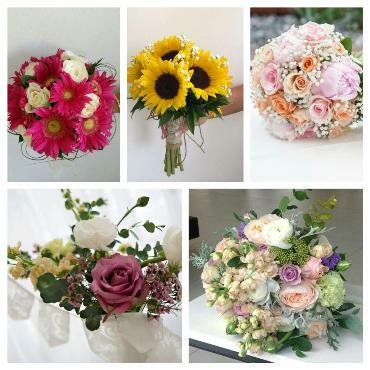 When you are looking at choosing your flowers, it’s a good idea to do some research and either choose a colour theme, then look for flowers in that colour, or, if you have a particular flower that you love, then build your bouquet and decoration flowers around that. See some of the beautiful flowers in our collage of pictures of bouquets and table decorations we have arranged for some of our past brides.